There’s an interesting experiment afoot in the startup community, which poses the following questions to entrepreneurs: Would you be willing to trade equity in your startup in return for social media buzz, and customer feedback? How much, if any, would you fork over? Minneapolis-based startup called Wahooly is both asking those questions — and proffering a few answers. Soft-launching in late September, Wahooly set out to create a platform on which socially-connected and early adopter-types, who are not accredited investors, can grab a small stake in up-and-coming startups by sharing their influence in exchange for a piece of the action. The goal: To help address one of the biggest obstacles encountered by early-stage companies — traction. Partnering with Klout, Wahooly has ammassed over 28,000 users, which Founder Dana Severson (a former business writer/blogger) says are all online infleuncers within the 90th percentile, according to Klout. Wahooly provides startups that need social media boosts and helping feedback with access to these “influencers,” allowing them to create testing groups of 5,000 to 8,000 people. Once formed, these groups take a share of between 4 to 6 percent in the startup. As to how it works, at a more granular level: Severson says that once users (a collection of bloggers, developers, and “web-lebrities”) join a startup, their share of the equity pool fluctuates based on a number of criteria, including feedback, which is tracked/rewarded in a point system. Users gain points based on three variables: The value of feedback (voted by the community), user activity (how often and to what extent they are using the service), and by influence (how many conversions their activity creates). Obviously, it’s in the interest of the user to focus on increasing the value of their startups, and the campaign continues until Wahooly exits, at which point users are paid based on their point total. While many startups are able to attract a decent amount of tweets, posts, mentions, and so on, the tipping point truly comes when this activity occurs concurrently and repetitively. But finding sustainability in brand advocacy is a difficult challenge, as user attention is fleeting, and most are wary of phoniness when it comes to repeat advocacy. That’s why Severson, who has also spent tim in advertising, wants to deliver a level of activity that will consist of 1,000 mentions over a single day — rather than over the course of a year — and then repeating that. A tricky feat, no doubt. Due to its unusual business model, Wahooly has been met with skepticism from some media, as the company plans to have quity stakeholders who take no action have their stake diluted (like a stock splitting), could potentially run afoul of the FTC and other regulators. Severson explains that part of the reason for this skepticism was due to the fact that the team hasn’t been willing to discuss how Wahooly is structured, holding off for competitive reasons. At this point, however, the founder is willing to share a bit more. Wahooly will always be the single shareholder in its startups, paying users based on its point system, with points being calculated against the net result of Wahooly’s success with its investments. It’s the same result for everyone, he says, while staying within the guidelines and allowing for the structure to be applied to international markets. In terms of the FTC’s potential interest, Wahooly’s users will be required to provide full disclosure. In other words, the affiliation/disclosure will appear on pages in which Wahooly users share. Because its users are influencers, the founder explains, they want to maintain their credibility and online reputations, and thus Wahooly wants to make it simple for the proper disclosures to be made. As to Wahooly’s progress: The company plans to introduce 200 startups to its users this year, and they’ve received over 300 applications thus far, and will be continuing to accept applicants going forward. Right now, Severson says, the focus is on consumer-based web applications. 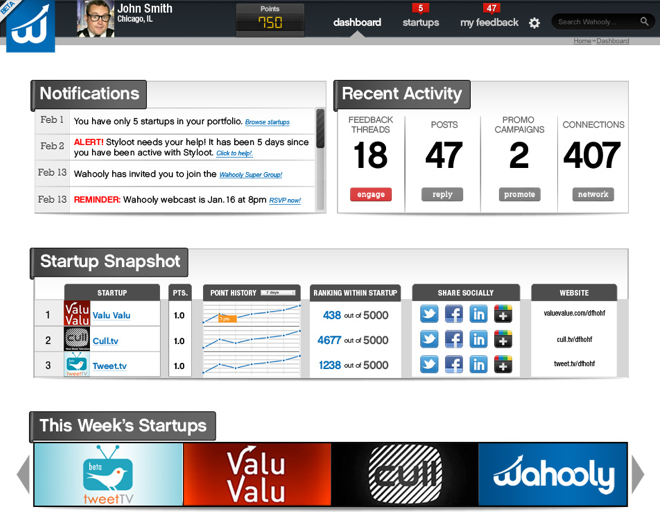 Today, Wahooly is officially introducing its first three companies: TweetTV.com, Cull.TV and ValuValu.com. The first, tweetTV is an Austin-based startup, building a web-based social TV Guide and Twitter-powered social TV platform that helps its users discover what to watch on TV and facilitates real tweet-based conversations around TV programs as they air. The second, Cull TV is attempting to reboot music television by leveraging leading recommendation and web data mining technology to helps anyone discover relevant, emerging talent through music videos. Currently experiencing a renaissance, music videos are the most popular way to distribute and consume music online, so Cull TV wants to give users a new and better way to discover artists. I’ve also just learned that a fourth startup, RAVN, which we wrote about in October, will be launching on Wahooly later this week. Check out the post for more here. Wahooly, which is walking the line between an accelerator and a crowdfunding platform, is definitely offering an unusual model, and could very well be a successful tool for startups looking to push past the early-adopter phase. But it could also be another sign that we’re on the doorstep/in the midst of another bubble. Whether or not Wahooly is successful depends on how influential its community truly is and whether they can really help startups get off the ground. Startups have to attract enough users or they will be overlooked, another challenge. It’s still early in the process to waylay judgement, but, as it scales, we’ll be able to get a better sense of how much real value Wahooly is adding to the ecosystem. It’s very likely that Wahooly will get early adopters feeling very tingly, but will the value be there? If it can deliver real acceleration in the market, Wahooly will no doubt race past the tipping point. The company is currently in the midst of raising its series A. For more on the model, check out Wahooly at home here.